M5 Worcestershire southbound severe accident, between J5 for A38 Droitwich and J6 for A449. M5 Worcestershire - Two lanes closed on M5 southbound between J5, A38 (Droitwich) and J6, A449 (Worcester), because of an accident. M5 Worcestershire - One lane closed on M5 northbound between J4, A38 (Bromsgrove) and J3, A456 (Halesowen), because of debris on the road. M5 Worcestershire northbound severe disruption, between J6 for A449 and J5 for A38 Droitwich. M5 Worcestershire - One lane closed on M5 northbound between J6, A449 (Worcester) and J5, A38 (Droitwich), because of a broken down vehicle. M50 Herefordshire eastbound severe accident, between J3 for B4221 and J2 for A417. M50 Herefordshire - One lane closed on M50 eastbound between J3, B4221 (Newent) and J2, A417 (Ledbury), because of an accident. Traffic is coping well. M5 Worcestershire southbound severe disruption, between J5 for A38 Droitwich and J6 for A449. M5 Worcestershire - One lane closed on M5 southbound between J5, A38 (Droitwich) and J6, A449 (Worcester), because of a broken down vehicle. Traffic is coping well. M5 Worcestershire northbound severe accident, between J7 for A44 Worcester and J6 for A449. M5 Worcestershire - One lane closed and queuing traffic on M5 northbound between J7, A44 (Worcester) and J6, A449 (Worcester), because of a multi-vehicle accident. M5 Worcestershire - One lane closed on M5 northbound between J8 M50 and J7, A44 (Worcester), because of an accident. M5 Worcestershire southbound severe accident, between J4A for M42 and J5 for A38 Droitwich. M5 Worcestershire - One lane blocked on M5 southbound between J4a M42 and J5, A38 (Droitwich), because of an accident. Traffic is coping well. 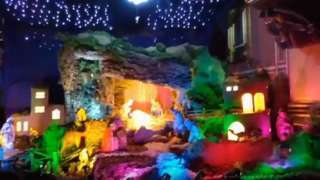 Children and engineers have built a nativity scene at St Francis Xavier's Church, Hereford, which includes waterfalls, a waterwheel and animal noises. M5 Worcestershire - One lane closed and slow traffic on M5 northbound between J5, A38 (Droitwich) and J4a M42, because of a broken down vehicle. Children helped create the nativity scene which includes a waterfall, animal noises and mist effects. 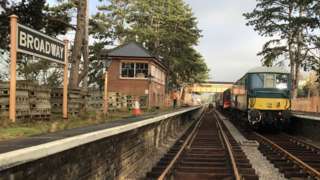 More than £1.3m was raised in 2016 by volunteers so the line could reach the village for the first time since 1960. M5 Worcestershire - One lane closed on M5 northbound between J6, A449 (Worcester) and J5, A38 (Droitwich), because of a vehicle fire. Traffic is coping well. M42 Worcestershire southbound severe disruption, at J1 for A38. A44 Worcestershire southbound severe disruption, at Quay Street. A44 Worcestershire - A44 Deansway in Worcester closed and slow traffic southbound at the Quay Street junction, because of a broken down lorry.